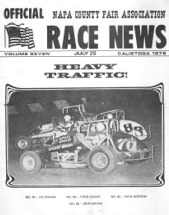 Calistoga Speedway is a legendary 1/2 mile track, located at the Napa County Fairgrounds in Calistoga, CA. Considered by many to be the most scenic race track in the country, "Sprint City" was once the home track of the Northern Auto Racing Club (NARC). After switching to "winged only" racing in the mid 1980s, the track continues to host events for the coveted Scarborough Trophy. Past Track Champions and stars include LeRoy Van Conett, Billy Anderson, Johnny Anderson, Brent Kaeding, Chuck Gurney, and Steve Kent. 2001- Steve Kent 2002- Jason Meyers 2003- Dennis Moore Jr.